Vinyl wraps can remain in pristine condition for upwards of 5 to 7 years. However, they do not have to remain on a vehicle for that extended of a time period. A unique advantage of vehicle wraps compared to any other form of advertising is actually their versatility. 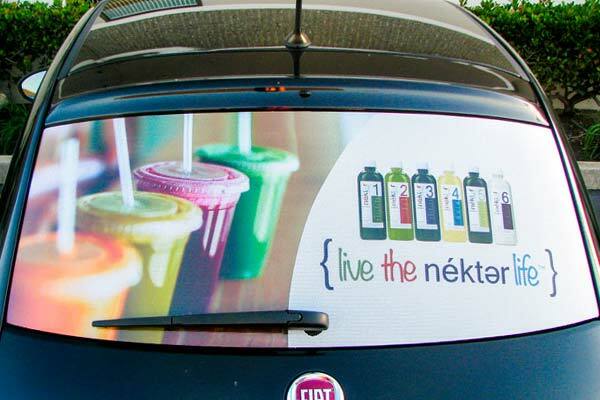 The featured vehicle wrap for Nekter endorses their Classic Cleanse. This cleanse features six cold-pressed detoxifying formulas specifically created to inspire healthier eating habits. The philosophy at Nekter is that cleanses should not be about deprivation, but about rejuvenation. Purifying ingredients boost the immune system, clear the skin, and revitalize the body and mind. Cleanses like these are important for busy, working people that struggle to maintain healthy eating habits. As Nekter develops new cleanses, they have the ability to change their vehicle wraps to meet their new demands. This versatility is permitted so easily for several reasons. First, the advertising medium belongs to you! With a vehicle wrap, you have the power to change the design whenever it is convenient for your business. Second, vehicle wraps are a comparatively inexpensive form of marketing. This lends itself naturally towards a form of advertising that can be altered at the owner’s convenience.